I have cut a lino before but without any tuition and using the cheapest tools available, so it was a real treat to spend a day finding out all about it, the equipment, inks, cutters and presses. There were just 2 of us on the course so we had plenty of room to spread out and Sam kept us well fed on home made cake and hot beverages - always a treat! Our first efforts were at mark making - using the different tools available to see what suited best. I think my favourites were the Pfeil ones as they sat nicely in my hand and were very sharp. We also used Japanese lino - a revelation as I'd previously used softsculpt, or those sheet of grey lino you buy from art shops. It's much easier to carve and great for fine detail. Here's the finished block! After inking up was explained I had a go and this was the result. We used Caligo inks which I have a small supply of at home. I realised that I could improve my work by just using the right tools such as a proper roller, instead of the red handled brayers I use for everything. We used printed on 4 different types of paper which Sam supplied, and tried out all her presses as well as the bamboo baron. 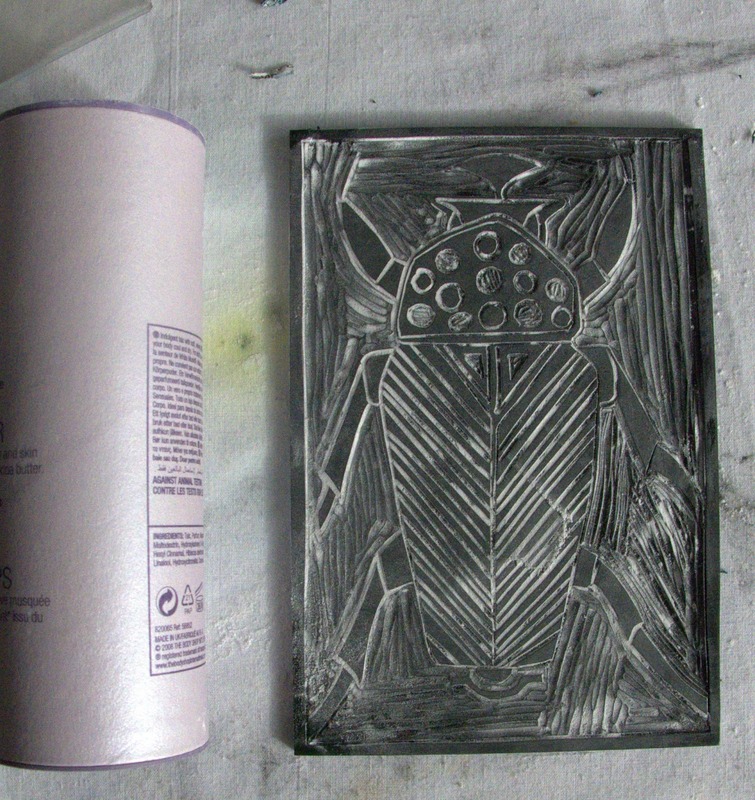 The next stage was to make a lino cut of something that we wanted to do, and in my case I chose a beetle from a wildlife book I have at home. The beetle wasn't a suitable shape for the size of lino so it was modified slightly in my sketchbook. I then traced from this ready to transfer the image to my lino. Adding a layer of talc helps you to see how the cutting is going. You could also put a sheet of paper on top and rub with a pencil. Here's the beetle all carved! I took a test print to see if I need to alter it before going on to print a few more using the different papers again. 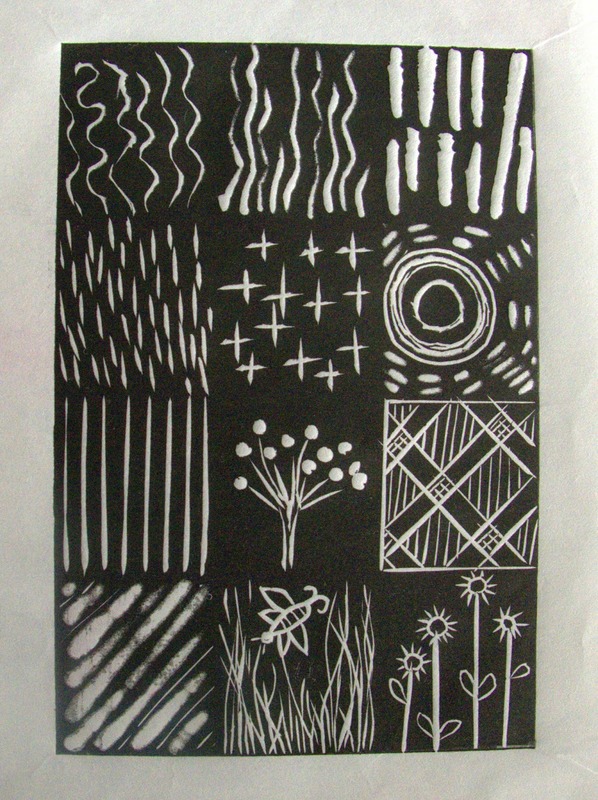 We then added coloured ink to a plain piece of lino and printed this off onto paper before adding another print on top. Here's the last one I did and you can probably see that I've scribbled quickly into the background green before printing the plate - just to see what happened. Heaps of potential for doing more of this!